Get the extreme gain of active pickups-with any pickup. 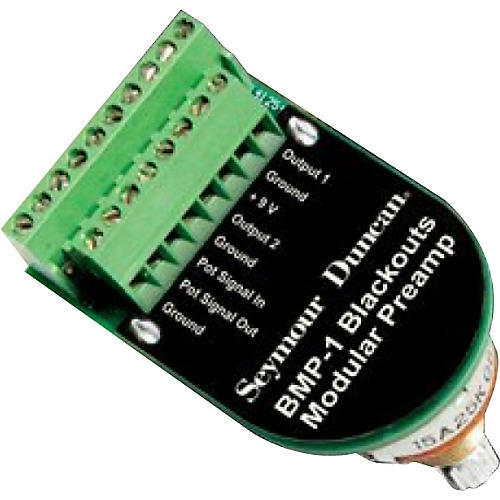 The Seymour Duncan Blackouts Modular Preamp turns your passive pickups into high-output active flame throwers. If you love the sound of active pickups but want to try it with a different look, Seymour Duncan has an ingenious solution. Blackouts Modular Preamp takes the preamp out of the pickups and integrates it with the volume pot. Now you can make any passive pickup with four-conductor cable an active pickup. The Blackouts Modular Preamp means you can get that high-gain, low-noise Blackouts sound with a vintage looking guitar-like a classic hot rod with a souped-up engine under the hood. You can use it with any passive pickup. Just swap your volume pot with a Blackouts Modular Preamp. It combines the high-output, low-noise Blackouts preamp with a quality volume pot and the Liberator Solderless Pickup Change System for quick connections. The genre-defining crunch and wail of modern heavy rock guitar often comes from active guitar pickups, which have a built-in, battery-powered preamp epoxy-sealed into a stark black casing. It's a distinctly modern sound married to a patently modern look. Now, for the first time, you can make any pickup an active pickup, even pickups with a more traditional look. Seymour Duncan has taken its award-winning, low-noise Blackouts balanced differential preamp out of the pickup and integrated it with a high-quality volume pot. Blackouts Modular Preamp is an ingenious way to get that high-gain, active guitar sound with any passive four-conductor pickup. Simply by swapping a volume pot for a Blackouts Modular Preamp volume pot, you can get active pickup performance with a more classic look. Connecting the Coil Pack or any pickup to Blackouts Modular Preamp is an incredibly simple, solderless procedure, thanks to the same bare-wire Lockdown connector stations used in the Seymour Duncan Liberator Solderless Pickup Change System. Installing pickups only requires a mini-screwdriver to secure pickup and battery leads into the rock-solid screw-clamp connectors. Get your own sound—with your own look. Order today.